Southwater Downs is an 8-acre / 3.27ha property at the top of a steep section of the southern N.S.W. coastal escarpment, and on the eastern edge of the Southern Highlands region. The reason it's important is that 3-1/2 acres / 1.36ha of the property contains Robertson Basalt Rainforest, a form of temperate rain forest dominated by lilly pilly (Acmena smithii, now Syzygium smithii) and sassafras (Doryphora sassafras). We entered into a Conservation Agreement on the rainforest segment in June 2011. (We have some prior experience in conservation, through our work on Bunhybee Grasslands, south of Braidwood, since 2008). A Conservation Agreement is effectively a permanent covenant, placing conditions on each successive owner, in relation to the 3-1/2 acres under the Agreement. The Agreement is inscribed on the title, binds all future purchasers, and is enforceable by the State Government. The forest segment is subject to a Plan of Management. This provides guidance on what has to be done to protect the forest, and what cannot be done in and adjacent to that area. Southwater Downs (SwD) is 90km km SSW of Sydney, 25km east of Moss Vale, 30 km due west of Shellharbour on the coast, 4km east of Robertson, and 1km north of the Jamberoo Road intersection. It's Lot 12 DP 616304, street address 4210 Illawarra Highway, and coords -34.572682, 150.626522, 724m (or S 34°34'21.654" E 150°37'35.478"). The gateway is at 740m, at the top of the escarpment and the creek-line on the western edge is at 700m. Average annual rainfall is about 1600 mm p.a. (64 inches p.a. ), and mists frequently swirl up over the ridge. an area map. SwD is in the centre of that map, on the western side of the road, just north of the '48' sign. (The '4210' indicates the distance from the junction of the Illawarra Highway with the Hume Highway to the west). The forest is on the reverse slope back from the escarpment, and the water runs north-westwards. The creek on the western boundary, at the bottom of the property, is at the very SE extremity of the Hawkesbury-Nepean river basin. It trickles into the headwaters of the Nepean River about 3km to the NW . (This interesting river system begins south of Sydney, flows through the western edges of the Sydney area, and runs out to sea to the north of Sydney). Visits to the forest are welcome, but arrangements must be negotiated in advance. Among other things, the cottage on the front of the property close to the Illawarra Highway is let to tenants. A general description of this community-type says that "the principal occurrence is on the Robertson Plateau around the town of Robertson on the Southern Highlands; the second is on the higher parts of the Cambewarra Range further to the south ...". It grows on tertiary basalts, which provide deep, red, fertile, well-drained soils. REPS provides a Guide to the Yarrawa Brush. Only 400-600 hectares remain, or about 20% of the forest's extent when white man arrived c. 1810. Most were cleared during an agricultural development phase in 1860-1900. "Remnants are highly fragmented, with most occurring on private land". The c. 1.5 hectares on the property is contiguous with a further c. 6 hectares on adjacent properties to the north and west. To the untrained eye, its extent appears to have been stable for several (human) generations. A couple of valuable REPS resources include an introduction, a rough map of the remaining segments and conservation issues. 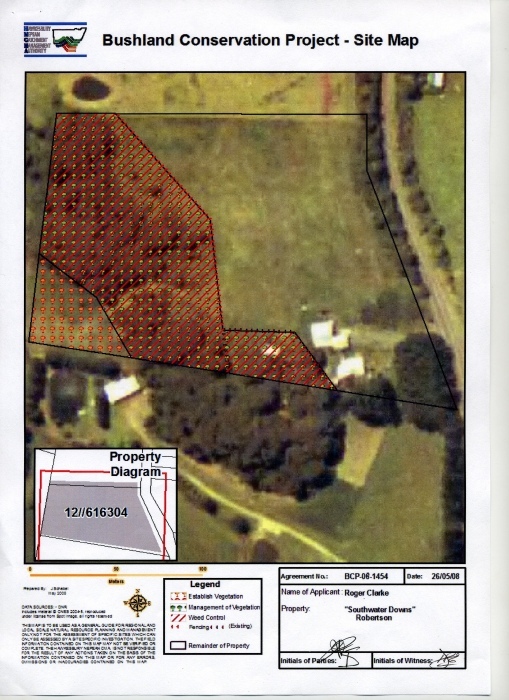 Another segment called Yarrawa Brush is within the 4.5-hectare Robertson Nature Reserve (which is 3 times the size of Southwater Downs remnant). The Reserve is 300m south of the centre of the village. (Turn down Meryla St). The main threats are introduced species at the forest edge, primarily blackberry (Rubus spp.) but also inkweed (Phytolacca octandra). Thistles are of some concern, particularly in the area adjacent to the creek. Wandering jew (Tradescantia albiflora) has made inroads along the forest floor. We believe we've worked out appropriate approaches to each threat. The primary focus is protection of the forest edge, and encouragement of native pioneer species in those areas. The forest is fenced off from the neighbouring paddocks. A considerable amount has already been invested in blackberry control, and in replantings in one key area. We've worked with the Hawkesbury Nepean Catchment Management Authority (HNCMA), and have greatly appreciated the help from Community Support Officer, Daniel Anderson. There's a local group called the Robertson Environment Protection Society (REPS).